during the CBD workshop at Basken. Our observations show that many villagers we work with have limited knowledge on the Convention on Biological Diversity. More training needs to be done throughout PNG on this topic if we are to meet some of our international obligations. We take this opportunity to thank the Convention on Biological Diversity (CBD) for its continued support to the indigenous local community resource owners in Papua New Guinea through us. On the 26-28 August, 2014, CBD sponsored Adolphina Luvongit from Mahonia Na Dari, Edward Yamai, from Mt Hagen Archdiocese and Wenceslaus Magun from MAKATA, representing NGO’s in PNG, to attend the Regional Capacity-Building Workshop for the Pacific Region on Traditional Knowledge and Customary Sustainable Use under the Convention on Biological Diversity. With support from the World Indigenous and Local Community Land and Sea Managers Network (WIN), managed by the Equator Initiative (EI) United Nations Development agency (UNDP), they remained in Apia, Samoa and participated in the Small Island Developing States Summit (SIDS), as community ambassadors for biodiversity in the SIDS process from the 29 August to 5 September 2014. We therefore acknowledge the support from WIN, EI, and UNDP. This will be the second CBD training in PNG for indigenous local community resource managers. The first workshop was conducted at Mur, Rai Coast District, Madang, in December 2014, with funding assistance from TNC. In this workshop we thank the Basken people for generously welcoming me to their village to conduct this training. Many thanks to my officer, Adolph Lilai and Karkum’s chief, Joseph Parek and his family for looking after me on my way to Basken and Michael the owner of the hire car I used. We thank Mark Khonn, the Business Development Officer for Rai Coast District, who organized this workshop and extend my gratitude to the Basken Elementary School Board and teachers for allowing us to use their classroom for the training. We thank individuals and family members who looked after Mr. Magun whilst in Basken village, particularly to Mr. Avon Wail, his dedicated wife and his family. This CBD training was conducted at Basken village, Sumgilbar Local Level Government, Sumkar District, Madang, Papua New Guinea. It takes about two hours by road to get to Basken from Madang town, the central city of Madang Province. Once you get to Karkum along the sealed main Madang-Bogia/Sepik Highway along the coast, you then take a detour and climb the hills on a dirt road till you reach Basken village which is about nine (9) kilometers from the main road at the Karkum village junction. The road to Basken can be impassable during wet seasons and one may only get there using four wheel drive vehicles. I was fortunate, in this trip, as the road was in a much better state when I visited Basken while overlooking the fact that the road truly needed urgent maintenance. Basken village has 5 major clans: Makakal, Maluwo, Nawang, Bopsu and Kumberken. They have two (2) elementary schools and one (1) primary school. They have one (1) Aid Post with a Community Health Worker serving them. They have a few primary industries which include: 6 Cocoa Driers; 18 Copra Driers made out of local timber, corrugated iron, flat metal sheets and bush materials; 5 Poultry farms; 2 Rice Milling Machines; 1 Drum Oven; and 1 Coconut Oil Press. There are three Christian denominations at Basken which include: Catholic, Christian Mission Fellowship and the Jehova’s Witness. Their Cash Crops include: Copra; Cocoa; Betel nut; and Market food crops. Other Income Sources are: 5 Trade Stores and 1 Petrol Station. They have a registered women’s group which assists local women with business skills, and other services called, Neksab Women’s group. Mr. Magun arrived in Madang on 25th of April and spent a few days coordinating this CBD workshop before traveling to Basken on the 29th of April. He did the workshop Overview that evening and showed a few educational awareness movies. He began the training on Thursday 30th of April and completed it on Friday 1st of May. He left Basken on Saturday 2nd of May and returned to Port Moresby that same day. Some of you may have read the first report on Mur Convention on Biological Diversity (CBD) training report. For those who have not sighted it, let us take you back to why we are running this CBD workshop. In 2014, 26-28 August, Adolphina Luvongit, Edward Yamai, and Wenceslaus Magun representing NGO’s in PNG attended the Regional Capacity-Building Workshop for the Pacific Region on Traditional Knowledge and Customary Sustainable Use under the Convention on Biological Diversity. With support from the World Indigenous and Local Community Land and Sea Managers Network (WIN), managed by the Equator Initiative (EI) United Nations Development agency (UNDP), they remained in Apia, Samoa and participated in the Small Island Developing States Summit (SIDS), as community ambassadors for biodiversity in the SIDS process from the 29 August to 5 September 2014. The CBD Workshop’s and SIDS Summit’s, Outcomes calls us to implement the Samoa Pathway. In order to do that, we ran a CBD workshop at Mur village Madang using TNC grant in December 2014. This will be our second CBD workshop. The target audiences of the workshop were indigenous local community resource managers from Basken and Karkum. Indigenous local community resource managers from Dimer and other inland villagers did not make it even though we had extended the invitation to them. They have instead asked us to run a separate training for themselves. This workshop covered both Plenary Sessions using flip charts, Group Work, Group Presentations and Plenary Sessions on CBD and Traditional Knowledge using PowerPoint presentations. In the evenings we showed the participants and the rest of the villager’s educational awareness videos ranging from “Mi Inap” a local movie which promoted self reliance in a village in Rai Coast, Madang to “Gifted Hands” a movie that tells the story of retired neurosurgeon Ben Carson. On Friday during the video session we got the participants to present their resource management strategies for Karkum and Basken communities to the audience. It gave the participants the opportunity to actually present their work to the rest of the community members. All the participants and their community leaders agreed that we should not present them their Certificates after the workshop until a proper graduation ceremony is arranged when they will invite Mr. Magun to present them their Certificates. They also assured Mr. Magun that they will use all the flip charts with notes written on them for all the Sessions and carry out awareness in their respective communities at their own convenience and time. The training motivated shy villagers who had traditional knowledge but felt “small” or not so important/insignificant to feel proud of themselves. They came out and shared their traditional knowledge and skills to the rest of the participants. One participant spent quite some time with Mr. Magun telling him his creative and innovative skills and abilities which he use to build village technologies for pulping rice, scraping coconuts, and making modified torch out of used and broken equipment parts and wood. This participant later visited Mr Magun prior to the video session at night and showed him his wooden hand crafted “Kalibobo” light house with actual light blinking when he switched on the battery controlled light switch. The artwork was so impressive Mr Magun wished he had sufficient money to buy it from him. We did not do the Monitoring and Evaluation exercise however, the participants urged MAKATA to conduct a similar training again so that many more villagers and indigenous local community resource managers can attend. They told Mr. Magun of how happy they are to have learned about how to manage their resources, PNG’s Biodiversity, PNG’s 4th National Goal and Directive Principle, the Protected Area Policy and about CBD and their Traditional Knowledge. At the end of the workshop, Mr. Magun left the address of the CBD on one of the flip charts on the classroom wall and encouraged the participants to write to the CBD Secretariat for assistance. For the full list of workshop participants including their names and contact details, refer to participants list in Annex III. Aim: Empower indigenous local community resource managers on Resource Management, PNG Biodiversity, PNG’s Fourth National Goal and Directive Principle, PNG’s Protected Area Policy and the Convention on Biological Diversity (CBD) and Traditional Knowledge. 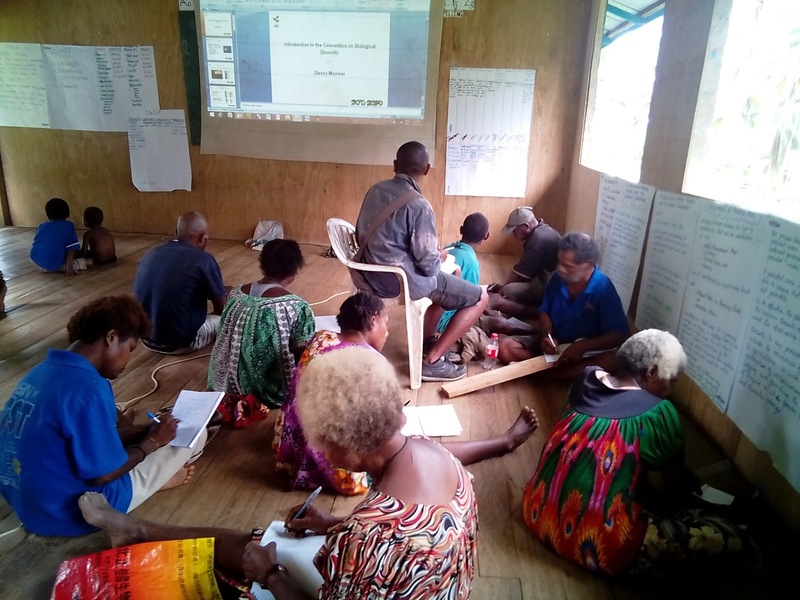 · Twenty nine (29) indigenous local community resource managers gained knowledge on Resource Management, PNG Biodiversity, PNG’s 4th National Goal and Directive Principle, PNG’s Protected Area Policy, Convention on Biological Diversity and Traditional Knowledge. These participants learned that the CBD under Article 8, paragraph (j) respect, preserve and maintain traditional knowledge of Indigenous Local Communities’ relevant to the conservation and sustainable use of biological diversity; promote its wider application with the approval and involvement of the holders of such knowledge; and encourage the equitable sharing of the benefits. · Participants encouraged to work with experts to adapt ‘Other Effective Area-base Conservation Measures’ that can be effectively used to achieve Aichi Biodiversity Target 11. This report is written in English. All the Sessions were also prepared in English but presentations were all done in the Melanesian Tok Pidgin the most commonly used language in PNG. Mr. Magun left Madang about 1 pm and arrived at Karkum village about 4pm in the afternoon. He called into chief Joseph Pareks house who welcomed him to Karkum. He spent a few minutes there at Karkum with Joe and his family catching up on their turtle conservation project’s activities and other local issues before hitting the road again for Basken with MAKATA’s Community Facilitator, Adolph Lilai who comes from Karkum. They arrived at Basken about 6pm in the evening. After being introduced to the family Mr. Magun was to stay with, Mr. Lilai returned to Karkum to bring a digital camera so we could capture photos from the workshop. Before leaving for Karkum Mr. Lilai got Basken Village Recorder, Mr. Henry Baleng to help Mr. Magun with Basken baseline study and assist him in the training as he was committed to some work back at Karkum village. Whilst Mr. Lilai left for Karkum village, Mr Magun had something to eat before showing a few videos starting at 7pm to the locals at Basken. When most of the villagers arrived, he was formally welcomed to Basken by their Ward 7 Councilor, Mr. Joe Lamit who then asked him to introduce himself and give the overview of the planned workshop. The day’s activities ended at about 12 mid night. We started the workshop at 9am with an opening prayer led by Wenceslaus Magun. Mr. Magun then welcomed all the participants and introduced himself. He then asked each of the participants to introduce themselves. He then asked the participants to go up to the flip chart pinned on the wall and indicate how much knowledge they have about the Convention on Biological Diversity. This exercise was to give him some background knowledge on the level of knowledge the participants had about CBD. This exercise showed that 85 per cent of the participants lacked any knowledge at all about CBD. Five per cent had heard or acquired some knowledge about it but don’t know much about it, four per cent were confused and one per cent indicated that he had some knowledge about it but is not too confident to talk about it. Once that was done, Mr. Magun recapped the Aim, Objectives and Overview of the workshop as demonstrated on Illustration 4 and 5 above which he had done the previous night during the video show. i). Conservation of biological diversity. Mr. Magun said for the participants to understand CBD, they need to first establish their own resource management areas. He emphasized that establishing protected areas is not simply setting aside a track of land for “protection.” Rather it requires developing a strategic landscape and land use plan or a community resource management plan. This is a big task and requires money, technical staff, and long-term funding if we are to adapt modern scientific conservation areas management tools. He elaborated further that in order for this protected area to be effective, their plan must address the various threats to the area and the biodiversity it supports. Mr Magun highlighted some of the threats to give the participants a fair idea about what he was talking about by drawing to their attention what JANT had done to the vast tropical virgin forest in transgogol, the Ramu Sugar and Oil Palm plantation that has transformed a virgin grassland habitat of the Ramu plains into agro-industry, and the Ramu Nickel and Cobalt mine at Krumbukari and Basamuk plant as few examples of extractive industries activities. He went on to point out threats by international ships berthing at the Madang wharf or other ports in PNG bringing in with them invasive or alien species, pollution, and other human social behaviors causing increase in global warming. He reminded the participants though that establishing “protected” areas is actually not a strange concept as most indigenous local community resource managers have traditionally practiced this one way or another through the establishment of “no go zones” called “ples masalai” or sacred areas. He said in some communities they practiced traditional management practices by following certain rituals to create, establish and abide by those rituals in ensuring that villagers and poachers don’t enter into the “no go” zones to hunt, fish, do gardening, collect fire wood or disturb the environment. Traditional sanctions are imposed to ensure that villagers respect the resource management areas. Those that break the rules usually suffer from some form of illness or experience some kind of misfortunes. Many indigenous tribal societies have practiced this and this was not something unfamiliar to the Basken and Karkum villagers. He drew cases from Kimadi and Magubem communities some 20 km from Basken in the sea turtle restoration and protection program (STRP) under TIRN, and sustained by MAKATA as classical examples to elaborate this case. Mr. Magun checked with the participants if they understood what he was talking about and got a favorable response. He then moved on to another setting in the modern case. He said today scientists and community organizers are building indigenous resource owners capacities to adapt modern resource management strategies to fulfill the CBD’s Objective which is linked to PNG’s 4th National Goal and Directive Principles and the Protected Area Policy. One way of doing this is to identify their Strengths, Weaknesses, Opportunities, and Threats using the SWOT analysis tool and the Specific, Measureable, Achievable, Relevant and Time bound or SMART analysis tool. He then took them through a breakout group exercise and helped them develop their Resource Management Strategy Plan. Just before lunch Karkum and Basken villagers made presentations on their SMART and SWOT analysis exercises. We then went for lunch at about 1pm. We resumed class at about 2pm. Mr. Magun then asked the participants to go into their respective groups and do their presentations on their Strategic Resource Management Plan. Both Karkum’s and Basken’s demonstrated that they grasped the knowledge and process of developing their resource management plans using their SWOT and SMART tools. They stressed that they will deliver their presentations to their respective communities and develop it further. This was satisfying to Mr. Magun. He then ended this session and moved on to PNG’s Biodiversity, PNG’s 4th National Goal and Directive Principle and linked this session with it. In this session Mr. Magun empowered the participants to see a broader picture of how their resource management plans fulfills PNG’s 4th National Goal and Directive Principle and the PNG’s Protected Area Policy which also fulfills the CBD Objectives. He informed the participants that PNG has a land area of about 462 840 thousand square kilometers and a total sea area of 3 120 thousand kilometers according to the National Sustainable Land Use Policy document. He said, it may seem that PNG has a huge land and sea area with a small population of about 7 to 8 million people but this is not true as some communities have much smaller land and sea areas compared to others. He used his own people of Bagabag, Riwo, Karkar and Manam Islands as examples to demonstrate this fact. Mr. Magun further elaborated that PNG occupies 1 per cent of the world land area, has about 6 to 7 per cent of world total biodiversity which is equivalent to 400,000 to 700,000 species from an estimated 14 million species on earth, according to PNG National Biodiversity Strategy Action Plan, 2007 (NBSAP). He added that PNG signed the Treaty on the Convention on Biological Diversity in 1992 and ratified it in March 1993. Under this obligation PNG must fulfill its international commitment to ensure that by 2020, 17 per cent of land and water resources and 10 per cent of marine resources should be protected. He added that PNG also ratified the Convention on International Trade in Endangered Species (CITIES), in 1976 which meant that Papua New Guineans are forbidden to trade endangered species such as sea turtles. He shared quote from Bruce Beehler et al in the Lessons Learn article for the YUS Conservation Program to stress that there is not one way of achieving conservation outcomes. “Every conservation project in the field is an experiment so one should think carefully, adapt, refine, and innovate.”(Beehler et al, 2013). (3) all necessary steps to be taken to give adequate protection to our valued birds, animals, fish, insects, plants and trees. He pointed out that according to the NBSAP report, after almost 40 years since independence in 1975, PNG is estimated to have an estimated 56 protected areas. This is about 3 per cent of the total land mass of PNG of 462 840 (thousand) square kilometers and a total sea area of 3 120 (thousand) kilometers according to the National Sustainable Land Use Policy document. He told the participants that this is far below the anticipated CBD Objective of 17% of land and water and 10% of marine resources to be protected by 2020. In fact Mr. Magun informed the participants that in essence, much of the 56 protected areas documented in the NBSAP document are not being managed adequately and some don’t seem to be in existence at all. In addition, he told them that this is compounded further by the fact that there aren’t any Ranger programs currently operating under the State’s relevant authorities or respective provincial authorities to ensure that the established protected areas are being managed. He then gave some examples of WMAs in PNG like Bagiai WMA, Kau WMA in Madang, and others. The participants learned that protected areas can be established for conservation, recreation, cultural, historical, ecological, scientific or other identified purpose either on State or alienated land or customary land (indigenous local communities land or unalienated land). He then explained to the participants what forms of protected areas they can establish on their customary land by explaining to them the options of creating Wildlife Management Areas, Sanctuaries, Protected Areas and Reserves. He used YUS Tree Kanagaroo Conservation Area as one good example. He added that there are also “Other effective area-based conservation measures,” such as the Conservation Deed tool which he adapted for Karkum turtle conservation program which expired in 2013 and is yet to be reviewed pending funding assistance. He told them that the State on the other hand can establish National Parks or Provincial Parks and Conservation Areas. Mr. Magun then gave examples of the Kuk Heritage site in the Western Highlands Province and the Variarata National Park at Sogeri, in the Central Province. He elaborated further that if a community intended to establish a National Park, they have to go through the process of selling their land to the State which would then convert their customary land to stand hold. This will then allow the State to establish protected area. But he said resource owners through the Indigenous Land Groups can also seek legal advice to lease their land to State or private corporations for that matter in order to acquire equitable economic gain. He informed the participants that 97 per cent of PNG land are customary owned. That makes it quite challenging and difficult for the State to fulfill its CBD obligation unless indigenous local community resource managers are empowered to establish protected areas on their land. He highlighted Target 12 to draw to the attention of the Karkum resource managers to realize why it is so important for them to save the critically endangered leatherback turtles. Mr. Magun further pointed out that, “there are only three (3) legal structures of Protected Areas in PNG and these are: i) National Parks; ii) Wildlife Management Areas; and iii) Conservation Areas. He warned the participants that the dangers of these laws is that there is no provision in the Fauna (Protection and Control Act) 1966 that prevents or protects our resources from extractive industries. The same is true for the Conservation Areas Act 1978, as the Minister for Environment and Conservation has the ultimate power over our resources. He said, the minister decides whether any mining, logging, or petroleum activity will or can take place or not and that decision can override the Indigenous Local Communities’ (ILC) decision in achieving their conservation or resource management plans outcomes if ILCs resource managers do not make bold decision to stop such activities taking place on their land whilst promoting sustainable resource management practices. In this session, Mr. Magun empowered the participants about what the Convention on Biological Diversity is. He touched on the Background of the Convention on Biological Diversity (CBD), the Objectives of the Convention (Article 1); Terms (Article 2); Institutional Framework; Secretariat of the CBD; the Thematic Programmes of Work and the Cross-Cutting Issues. He informed the participants that CBD was opened for signature in Rio in 1992 (the Rio “Earth Summit”). In 1992 – 193 countries signed the legally-binding treaty. He added that 39 countries have ratified the Protocol and that PNG signed it in June 1992 and ratified it in March 1993. “That means that PNG has made a commitment to fulfill the objectives of the CBD which are: i) Conservation of Biological Diversity; ii) Sustainable use of its components; and iii) Fair and equitable sharing of benefits arising out of the utilization of genetic resources, ” he stressed. He used couple of examples to demonstrate further the objectives of CBD. Mr. Magun informed the participants about the Seven (7) Thematic Programmes of Work established by COP which include: Agriculture Biodiversity, Dry and Sub-humid Lands Biodiversity, Forest Biodiversity, Inland Waters Biodiversity, Island Biodiversity, Marine and Coastal Biodiversity, and Mountain Biodiversity. The participants were asked to go up to the front and identify which Thematic Program of work their resource management program came under. It was interesting to see them indicating Targets i) Aichi Biodiversity Targets, ii) Access to Genetic Resources and Benefit Sharing, iii) Biodiversity for Development; iv) Biological and Cultural Diversity; Communication, Education and Public Awareness (CEPA); Gender and Biodiversity; Protected Areas; Sustainable Use of Biodiversity; Traditional Knowledge, Innovations and Practices etc. He then summarized the Cross-Cutting Issues which corresponded to the issues addressed in the Convention’s substantive provisions in Articles 6-20, and provided bridges and links between the thematic programs. These Cross-Cutting Issues included: Aichi Biodiversity Targets; Access to Genetic Resources and Benefit Sharing; Biodiversity for Development; Biological and Cultural Diversity; Climate Change and Biodiversity; Communication, Education and Public Awareness: CEPA; Economic, Trade and Incentive Measures; Ecosystem Approach; Gender and Biodiversity; Global Strategy for Plant Conservation; Global Taxonomy Initiative; Impact Assessment; Identification, Monitoring, Indicators and Assessments; Invasive Alien Species; Liability and Redress – Article 14(20; Protected Areas; Sustainable Use of Biodiversity; Tourism and Biodiversity; Traditional Knowledge, Innovations and Practices – Article 8(j) and related issues including 10(c); and Technology Transfer Cooperation . He reiterated the three (3) Objectives of the Conventions: i) Conservation of Biological Diversity; ii) The Sustainable use of its components; and iii) The fair and equitable sharing of its benefits arising from the utilization of genetic resources. He then pointed out its Vision: “By 2050, Biodiversity is valued, conserved, restored and widely used, maintaining ecosystem services, sustaining a healthy planet and delivering benefits essential for all people. He informed the participants that Strategic Goal A – addresses the underlying causes of biodiversity loss by mainstreaming biodiversity across government and society! He said Target 1 for this Strategy, demands that by 2020, at the latest, people are aware of the values of Biodiversity and the steps they can take to conserve and use it sustainably. He then connected this Target to PNG’s Protected Area Policy Goal so the participants can make sense out of it. Mr. Magun once again reiterated the steps taken by Karkum villagers are actually fulfilling this Target. He told the participants that, one of the reasons CBD has engaged him and his team to conduct this training is to fulfill this Target. The participants then went for a lunch break at about 2pm before returning at 3pm for the next session on Connecting Traditional Knowledge and Conservation. For this session, Mr. Magun used the Powerpoint to do his presentation. Mr. Magun informed the participants on the World Intellectual Property Rights. Mr. Magun told the participants that the Intellectual Property or IP refers to the creation of mind such as invention, designs, literary and artistic works, performances, plant varieties and names and signs and symbols. He informed the participants that the World Intellectual Property Organisation (WIPO) recognizes those traditional elements as protectable. “IP would enable their holders to have a say over their use by others,” he said. He added that in 2007, the United Nations (UN) General Assembly adopted the UN Declaration on the Rights of Indigenous Peoples. He said TK is a living body of knowledge that is developed, sustained, and passed on from generations to generation within a community often forming part of its cultural or spiritual identity. He added that TK is knowledge, know-how, skills, innovations or practices passed between generations in a traditional context that form part of the traditional lifestyles of indigenous and local communities who act as their guardians. He gave examples of TK as: i) Knowledge about traditional medicine; ii) Traditional hunting and fishing technique; and iii) Knowledge about animal migration patterns or water management. Furthermore, Mr. Magun informed participants that TCE are forms in which traditional culture is expressed. This can be in songs, dances, handicrafts, designs, ceremonies, tales, or artistic or cultural expressions. He urged the participants to benefit from TK and TCE. He said indigenous peoples and local communities that develop, maintain and identify culturally with them should gain from these TK or TCE and must not be exploited or be used by outsiders especially local tourist operators, scientists, industries, universities and others. This was in fact a very lively session as participants once empowered, felt they were knowledgeable on so many things regarding conservation and biodiversity, cultural heritage, songs and dances, expressive arts and so forth. He said PNG needs laws, procedures and policies to ensure benefit-sharing once genetic resources leave the country. He emphasized that there is a need in PNG for clear procedures when accessing genetic resources. Mr. Magun added that once that is in place, the users can then go ahead and develop products either for non-commercial or commercial utilization using the GR (and associated TK): e.g. basic research, research and development, development of new pharmaceuticals, biotechnological products and etc. He reiterated that benefits-sharing (monetary and non-monetary): eg. Royalties, technology transfer, training and etc can then be shared between the user and the provider equitably based on the MAT. Video Session: At night Mr. Magun continued with video shows till 12 mid night. Many words of acknowledgement and appreciation were shared during the video session and closing up ceremony. Mr. Magun was given a big dish of cooked vegetables, greens and a whole roasted chicken. Thank God he was allowed to share the food with others. (4) Wenceslaus to burn copies of the topics taught and other CBD resource materials onto CDs for these participants. He will hand deliver these CDs to the participants when he next visit these communities and present both the CDs and their Certificates. (5) Wenceslaus will continue to liaise with CBD for additional information. (7) The training workshop was the second of its kind in Madang and has generated a lot of interest among the participants. Wenceslaus Magun is the Project Coordinator for MAKATA’s Turtle Program and was responsible for all logistics and coordination. Wenceslaus put in fulltime for this training program taking care of all logistics, coordination and support. He also facilitated the training on Traditional Knowledge, PNG’s Protected Area Policy and how it is linked to the Convention on Biological Diversity and what conservation practitioners do on the ground to implement these policies. He has represented his organization in numerous international gatherings including the inaugural World Indigenous People’s Conference in Darwin in 2013, and the recent Convention on Biological Diversity workshop in Apia Samoa in 2014 as well as the Small Islands Development States Forum also held a week later in Apia, Samoa. The training workshop seeks to enhance the capacity of Indigenous Local Community Resource Managers on the Convention on Biological Diversity. It specifically seeks to build a grassroots constituency for conservation by raising awareness on Developing Community Resource Management Plan, PNG’s Biodiversity, PNG’s 4th National Goal and Directive Principle, PNG’s Protected Area Policy, Convention on Biological Diversity, CBD’s Targets, Traditional Knowledge and Nagoya Protocol. (4) Share this course content on Web2 and with relevant partners and stakeholders. Mr Magun did not conduct the Evaluation exercise. However, the general feedback he received from the participants was very positive. The participants appreciated the course content. They could practically relate to the lessons from developing their strategic resource management plan, to seeing value in PNG’s biodiversity, to the PNG Constitution, PNG Protected Area Policy and how it relates to the CBD. They fully understood their role in establishing protected areas on their customary land to fulfill the CBD’s objectives. They also appreciated and value their traditional knowledge and cultural rights after learning some profound lessons on CBD’s Traditional Knowledge and the Nagoya Protocol and how it relates to achieving Conservation outcomes. They also asked Mr. Magun not to present their Certificates after the workshop but to wait until a ceremony is organised for the official presentation of their Certificates. They will inform and invite Mr. Magun for their graduation ceremony. CONVENTION ON BIOLOGICAL DIVERSITY TRAINING. WHY SAVE THE LEATHERBACK TURTLES IN MADANG? MAKATA’S BACKGROUND AND CONSERVATION APPROACH.